It is 1904 and the SS Danzig is sailing from a port in Europe to New York in America. 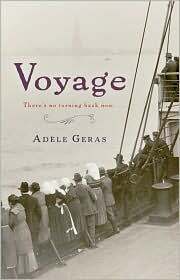 In her steerage section, packed together liked animals, there are people from all over Europe who are looking for a new life in America. Many are running away from something; from poverty and oppression, from injustice and danger. Among these passengers are Mina and her family, Rachel and her father, Yasha, Daniel, and Golda and her baby who are to be reunited with Golda’s husband in the land of opportunity. Mina and Daniel soon make friends when they both find they equally dislike a boy called Yankel. Daniel is kind to Mina’s “slow” brother Eli. He knows that Mina worries about her brother and he helps her take care of the boy, keeping an eye on Eli and making sure that he does not get into trouble. Rachel is still hurting from a terrible loss and her father hopes that a new life in America will help her recover. He hopes too to arrange for a good marriage for Rachel. She does not know about this as yet and she thinks often about the fiancé who was beaten to death in her homeland, his only crime being that he was in the wrong place at the wrong time and that he was a Jew. Yasha fled his home because he could not marry the girl his parents found for him. He hopes to become a jeweler when he gets to New York but he finds the most precious jewel of all on the SS Danzig, in the middle of the Atlantic, long before he gets to America. For him Rachel is the most perfect gem in the world. As we follow the stories of the people on this ship we cannot help hoping and suffering with them. When Mina risks a great deal to steal food for her ailing mother, we worry that she will get caught, and when Golda’s baby gets ill we wonder what can be wrong with the little infant who has not yet even had the chance to see its father. With humor, sympathy, and great understanding, Adele Geras tells the story of these brave and abiding people who manage to find friendship and love despite the terrible conditions that they have to endure. Together they form a community and together they manage to bear the hard voyage to America. This superb book will give readers an extremely personal and up-close picture of the immigrant experience.